Herpes of the eye or ocular herpes is a severe viral infection caused by type 1 Herpes simplex virus. The infection is recurrent and may cause irreversible damage to certain parts of the eye. Inflammation predominantly affects the cornea. If it lasts for a long period of time, is frequently repeated or severe in nature, inflammation may easily cause scarring and vision loss. Herpes virus infection of the eye develops after a person comes in close contact with the infected individual. The virus is transmitted directly into or near the eye. Herpes keratitis is a viral infection affecting the cornea. This is, actually, the most common form of ocular herpes. In the majority of cases inflammation affects only the epithelium of the cornea. If, however, virus penetrates into deeper tissues, their inflammation is associated with scarring. Infection of deeper tissues of the cornea is known as stromal keratitis. Scarring is, in this case, a cause of vision loss and complete blindness. Fortunately, stromal keratitis is not so frequently reported. Finally, there is iridocyclitis, a form of inflammation of the iris and surrounding tissues characterized by intensive pain, photophobia, blurred vision and eye redness. 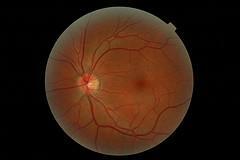 In rare cases herpes virus may penetrate deeper to the retina and cause herpes retinitis. Treatment for ocular herpes basically depends on the form of the disease i.e. the part of the eye that is inflamed. Each and every patient is treated individually. Ophthalmologists pay close attention not to prescribe treatments which can aggravate the outbreak of infection. Superficial herpes infection, located only in the corneal epithelium, is easily brought under control with antiviral eye drops and ointments as well as oral antiviral pills. Zirgan has been used topically even since it was approved by the FDA in late 2009. The eye drops are instilled five times per day until the corneal ulcer completely heals. It is essential to stop wearing contact lenses during such treatment. Infected corneal cells can be additionally scraped away with a cotton swab or corneal 'spatula' instrument. This procedure is called debridement and after it is performed healing of the cornea is accelerated with the assistance of a patch or soft contact lens. Inflammation of deeper tissues is treated with steroid drops which are only administered together with antiviral drops, never alone. Steroid drops are, however, associated with recurrent infection in susceptible individuals. Secondary bacterial infection requires antibiotic eye drops and surgery is left only for patients with severe scarring of the cornea. Permanent scarring of the cornea accompanied by severe loss of vision is an indication for a corneal transplant. What Causes Bumps In The Pubic Area? Can I take aciclovir for my eye condition? Am I a candidate for a cornea transplant? How soon will my vision improve after cutting cornea accidentally? Could Scar tissue be forming on the cornea?